Over the years, pumpkin pie desserts have crowned many a holiday table. 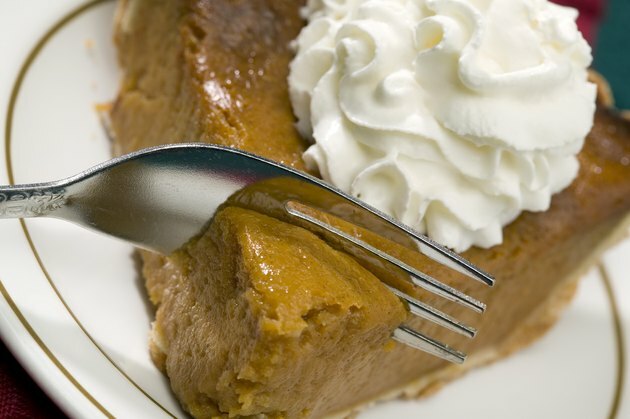 If you lead a busy lifestyle, purchasing a pre-cooked pumpkin pie dessert can be a real time-saver. Costco is a wholesale retailing outfit with stores worldwide. Costco offers its own brand of goods, including pumpkin pie and pumpkin pie cheesecake. However, you must purchase a membership to shop at Costco. As a dessert item, even one serving of a Costco pumpkin pie is high in calories. A serving of one slice, comprised of one-12th of a pie or 4.8 oz., contains 310 calories, according to LiveStrong.com MyPlate. One slice of Costco pumpkin pie cheesecake has even more, 420 calories. If you consume the usual diet of 2,000 calories per day, one slice of these desserts provides 16 to 21 percent of the calories you require for the day. Although you need some fat in a nutritious diet, you don't want to get too much. One serving of Costco pumpkin pie has 11 g total fat with 3.5 g saturated fat and 65 mg cholesterol. The nutrition website My Fitness Pal states one serving of Costco pumpkin pie cheesecake contains 24 g total fat with 14 g saturated fat and 90 mg cholesterol. Getting too much saturated fat and cholesterol in your diet can increase your risk of developing health problems, such as high cholesterol and heart disease. For that reason, it's best to enjoy these high fat desserts only occasionally. Carbohydrates are the starches and sugars in your foods and provide your body with the energy it needs. One serving of Costco pumpkin pie has 48 g of carbohydrates with 30 g of sugar, and a serving of Costco pumpkin pie cheesecake has 47 g of carbohydrates with 37 g of sugar. The American Heart Association recommends women get no more than half their discretionary calories, or 100 calories, from sugar and men get no more than 150 calories a day from sugar. Your body cannot manufacture sodium on its own; you must obtain it through your regular diet. However, the Institute of Medicine states you don't need a lot, no more than 1,500 mg to 2,300 mg of sodium each day. One serving of Costco pumpkin pie has 370 mg of sodium and one serving of Costco pumpkin pie cheesecake has 420 mg of sodium. Consistently consuming too much sodium makes it more likely you will develop high blood pressure and heart problems.